WorkSafeNB has received a number of accident reports involving workers falling from stepladders. On average, 10 workers die every year after a fall from an elevation. A business owner sustained fatal injuries after falling from the top of a six-foot stepladder. He had been performing some maintenance activities and was about to descend to the floor when he fell. A young worker sustained some minor injuries and was knocked unconscious when he fell approximately five feet from a 10-foot stepladder in a retail store. He was placing some merchandise onto shelving and as he was descending the ladder gave out and he fell, striking his head on the floor. Fully open the stepladder on a level surface and lock its spreader in place. Never use a stepladder folded up and leaning against a surface. Ensure a proper size, type and grade of ladder is used for each task. Avoid household ladders on job sites. Never climb on top step or shelf of a stepladder. Never place the stepladder on unstable surfaces such as boxes or scissor lifts to gain extra height. 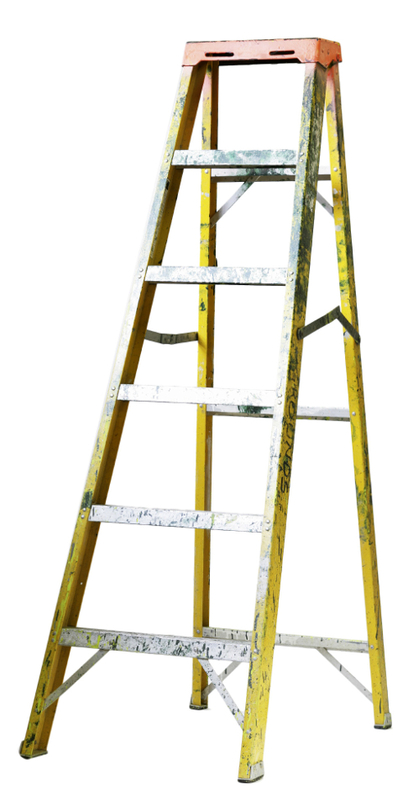 Maintain three-point contact with the ladder while climbing (such as one hand and two feet). Brace yourself with your free hand. Always face the stepladder treads while climbing. Never overreach or lean to one side while using a stepladder. Always keep your shoulders within the rails. Never carry heavy or bulky objects that may make going up or down a ladder unsafe. Stepladders should only be used for light duty tasks of short duration. Avoid strenuous work such as pushing or pulling.